There are two different categories of seat covers for dining room (and kitchen) furniture. 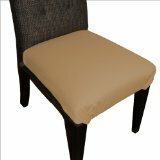 The two categories are best described as: Dining Chair Seat Covers and Slipcovers. The table below describes will give you a quick overview of the differences. Given how different the two products are from one another, it will help to be clear on your primary purpose before exploring further. If you want to change the look of your room than a slipcover is for you and you can learn more about them here. But, if you want to protect your chair from wear, tear, spills and stains then you’ll want a dining chair seat cover and can learn how to pick the right one for you here.